WE FINANCE EVERYONE REGARDLESS OF CREDIT!! GUARANTEED CREDIT APPROVAL!! HABLAMOS ESPANOL!! 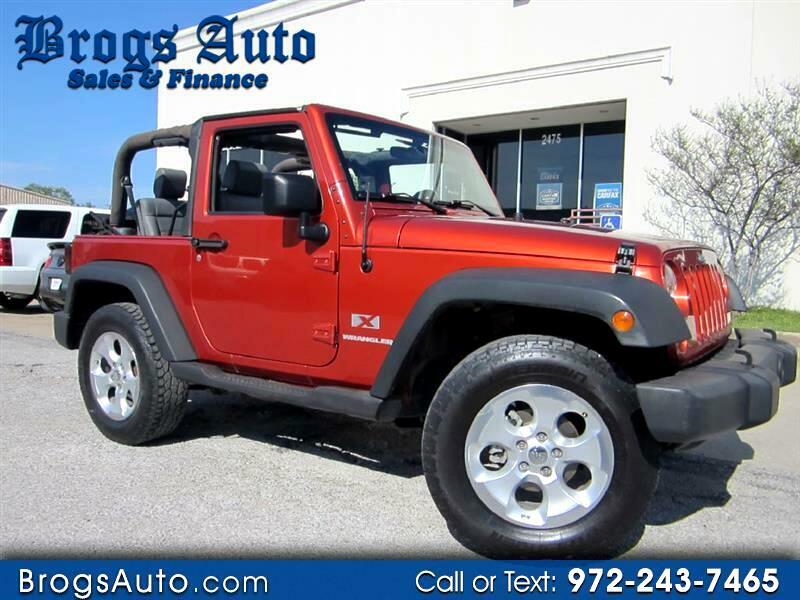 ***THIS JEEP HAS NO A/C IT WAS MEANT TO BE USED WITOUT TOP*** BRAND NEW SOFT TOP INCLUDED!!! Beautiful Jeep Wrangler 2009 Sport Utility X Model. CERTIFIED CARFAX AND AUTOCHECK CLEAN VEHICLE. NO A/C, Orange EXTERIOR with black and gray cloth seats interior, SOFT TOP 2 doors, this vehicle is equipped with a 3.8 6 cyl engine, 4WD Manual Transm, ABS brakes with traction control system, tilt steering wheel, active belts, full airbag system, CD/AM/FM stereo system. beautifully kept. It drives and runs perfect. Oil service has been performed, new filters. See more pictures at www.brogsauto.com We take Visa, MasterCard, AMEX & Discover cards, bank drafts & cashier's checks also accepted, always taking trade-ins, all makes and years take the phone and call us now, visit Brogs Auto online at www.brogsauto.com to see more pictures of this vehicle or call us at 972-243-7465 today to schedule your test drive. Available 4 years/unlimited miles extended warranty available! Hard top Removable Roof Panels.